Another organization of interest to MIS students is the MIS Corporate Advisory Board. The advisory board meets on campus to discuss current topics, learn about industry needs and future directions, and to give students an opportunity to speak informally with these representatives. About half of the board members are ISU alumni who work as MIS professionals in a variety of industries. 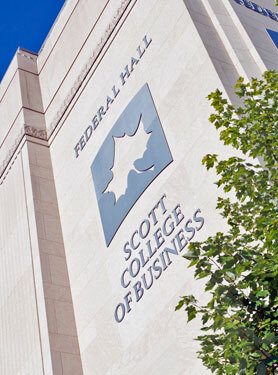 The College of Business has many other professional student organizations for its students. While many are associated with majors, like MISA, others are applicable to all areas of business. Delta Sigma Pi and Alpha Kappa Psi are general business fraternities. Beta Gamma Sigma is the honorary for outstanding business majors; membership is by invitation only.